Christina (Center) with fellow Cleveland Foundation Summer Interns Eman (Left) and Caroline (Right). 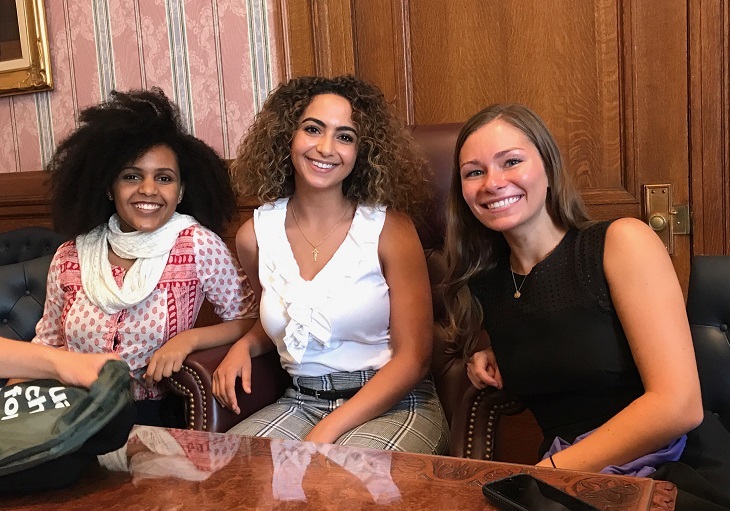 Our #SummerOfPurpose blog series follows this year’s Cleveland Foundation Summer Interns as they spend 11 weeks working with Cleveland-area nonprofit and public sector organizations. 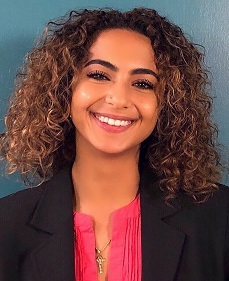 In today’s blog we hear from Christina Abdelshahid, who spent her summer working with the Economic and Community Development Institute (ECDI) where she created and conducted surveys to support ECDI’s small business loan program, culminating in a final report to the Northern Ohio lending team. 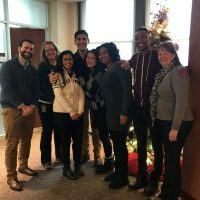 The experience of being in the Cleveland Foundation Summer Internship Program has been extremely valuable for me to understand the nonprofit sector in Cleveland and the interactions that different organizations have that allow for powerful, influential moves to be made with the intent of providing a greater good for individuals and communities. 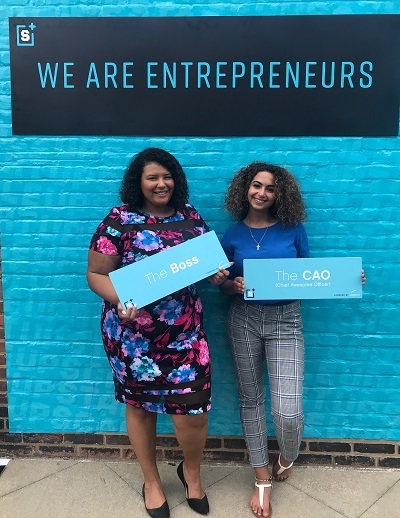 With the Cleveland Foundation being at the epicenter of these relationships and interactions, it has been extremely valuable to be exposed to these environments and conversations as an intern. The most challenging aspect for me has been to adapt to a 9 am – 5 pm lifestyle. As a student, I am accustomed to working on my own schedule. Though a simple challenge, it has been one that I have struggled to adapt to and has also been a learning experience in teaching me when I am the most productive. When I am not working, I enjoy exploring the city and discovering the hidden gems that aren’t necessarily well-known. 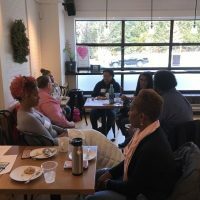 I do have my “spots” that I love to go to in the Metroparks or at a local coffee shop that I have actually had the pleasure of taking some friends in my SIP cohort to. After experiencing the nonprofit sector in Cleveland, I want to venture out to other cities, states, and even countries after I graduate from Ohio State’s Fisher College of Business, in order to gain different perspectives on how to fuse business and the nonprofit sector to provide for a greater good, while also strengthening businesses and promoting economic stimulation. I am an extremely passionate believer that social enterprise is the future of both the nonprofit and private sector. This internship has allowed for me to grow personally by experiencing communication on a different landscape. Prior to this internship, I did not understand the importance of communication – the impact of the words we say and how we say them. From words to body language, empathy, kindness and respect have an incredible impact if we are able to communicate them. I intend to be a guide or a leader in whatever position I end up in the future, and this lesson was imperative for me to learn during my process of intense growth, where I am developing who I am and how I can improve on a daily basis. Jetari, a Relationship Manager at the ECDI, has taught me this indirectly just by trying to be the most positive influence he can be on everyone he comes in contact with throughout the day, simply by asking how you are and truly caring. He is an example of someone who is extremely emotionally intelligent and is humble enough in knowing himself to be able to care for other people. Thank you, Jetari. Professionally, I have grown to understand that I would definitely like to be doing a job that is “out in the field.” People work better in different environments, and I have come to learn that flexibility in where I can work and a constantly changing environment is one that is suitable for me. What advice do you have for someone considering applying for the Cleveland Foundation Summer Internship Program? 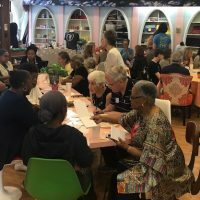 For anyone considering applying to the Cleveland Foundation Summer Internship Program, do so if you are committed to helping people and learning about the environment around you in Cleveland. Genuine curiosity goes a long way.